Market based congestion management is used to take into account the physical transmission capacity of the European power grid within the electricity market model. On the one hand, any transmission of electrical energy has to be executed within the technical limitations of the power grid. On the other hand, the detailed representation of all technical restriction would be very complex, as the exchange between any two grid nodes will always generate load flow between a large number of grid elements. Such a nodal model would not be sufficiently intuitive and the conventional, non-automated, trade would be much more difficult. The European domestic electricity market is thus based on a zonal market model, which contains a significant simplification of the grid restrictions to be able to offer the most intuitive and stable framework conditions for the competition of demand and supply. The zonal market model consists of individual bidding zones, which eliminate transport restrictions during transmission within their boundaries. Transmission tasks that resulted from internal transactions are guaranteed by the relevant transmission system operators. The term “bidding zone” makes it clear that all purchase and sale bids within the zones can be combined without grid restrictions. Occasional overloads of grid elements are avoided through targeted interventions via the transmission system operator’s system operation (e.g. redispatch), in order to avert damage from the grid and to maintain system safety at all times. The costs of temporary internal grid congestion is socialised via the grid charges; a short-term internalisation of this congestion is not possible in the market model and frequent changes of the bidding zones would destabilise the model and, with it, jeopardise the conditions for competition and investments. While the zonal market model is abstracted with grid restriction during internal transactions, the cross-zone exchanges are limited, in order to avoid regularly overloading the transmission grid. In principle, the efficient bidding zone layouts follow the structural congestion in the European grid and bidding zones are characterised by the normal distribution of load and production to match the internal transmission capacity. 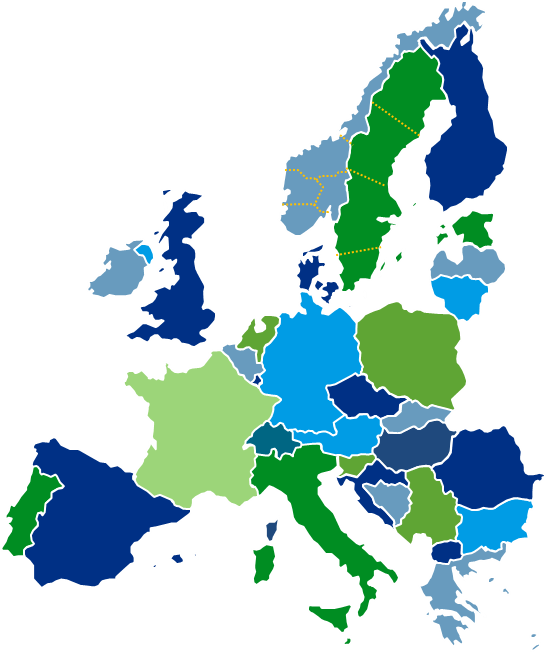 Since the border interconnections between the various European Member States have historically been equipped somewhat weaker, they often mark the borders of the bidding zones and therefore the bidding zones correspond to the borders of the respective state territories. The electrification of the previous century and the resulting grid expansion have traditionally been seen as a national infrastructure task and the exchange with neighbouring countries had so far taken a more subordinate role. The merger of Germany and Austria into one bidding zone is a definite exception and is a result of the traditionally tight cooperation of the two countries and the strong interdependence of their respective grids. Borders between adjacent bidding zones are considered as (structural) congestion in the zonal market model. Congestion management, in the narrower sense, refers to the restriction of exchange of electrical power through the structural congestion to the available transmission capacity. Since the bidding zones always consist of one or more control areas, meaning that each bidding zone is also a control area, the exchange between neighbouring control areas of transmission system operators can be controlled by regulating the current accounts.1 The current account balances, meaning the export or import items of the control areas, are the result of cross-border schedules. Power exchange schedules between balance groups of the various bidding zones require a transmission right in the zonal market. Should such a transmission right not be on file, a cross-border schedule will be rejected. This allows the TSOs to control the maximum current account balances via the allocation of transmission rights. By setting the quota for transmission rights to the level of the available transmission capacity at the time, the transmission system operators can effectively prevent overloading critical grid elements. In the following, the market-based congestion management will be divided into the components Capacity Calculation and Capacity Allocation. 1The load flow resulting from the exchange is of course limited by the laws of physics and it therefore does not always match the defined limits. Capacity calculations anticipate this discrepancy between commercial exchange and the actual load flow. Defining the capacities may therefore again include various simplifications (see NTC vs. flow-based). The NTC methods define the transmission capacities of each congestion event as an independent maximum scheduled exchange output in Megawatt [MW]. These may be different for the respective directions. Any pre-existing interactions with other borders are taken into account in the form of assumptions and included into the NTC. The Flow-Based model does not condense the relevant grid restrictions into a value per border and direction, but represented them as a simplified grid model. During the subsequent capacity allocation, the interactions between several borders (within the same flow based process) can be specifically taken into account. The Flow-Based model can therefore function with less assumptions and allows for a more precise depiction of the grid restrictions in the market model. Since the added accuracy in comparison with the NTC model goes hand-in-hand with a less intuitive understanding, the Flow-Based model is usually only used in conjunction with implicit allocation procedures, the so-called Market Coupling (see below). Capacity Allocation is also done according to two different procedures, the Explicit Allocation and the Implicit Allocation. Both procedures serve different purposes and have their rightful place. The so-called Explicit Allocation takes place outside of the electricity market transactions. To do this, the available transmission capacity is confirmed in documents as transmission rights. Market participants can purchase these transmission rights either at classic auctions, or, in the case of very short-term allocations (Intraday), also according to the first-come-first-served system. The market participants, in their roles as balancing group managers, can then, by means of these transmission rights, register cross-border schedules and thus transfer electrical energy into other bidding zones. Transmission rights are, in principle, issued for a specific direction, meaning that transmission rights for direction AB and direction BA are two separate rights. As a rule, transmission rights are allocated as integer multiples of 1 MW. Transmission rights are usually issued in the form of options, meaning that a schedule does not necessarily have to be registered. However, in the case of the explicit intraday allocations, the assigned transmission rights are obligations and their execution must be registered as a schedule. The balancing groups’ requirement from their balancing groups to present balanced current accounts on their respective sides of the borders is of course not affected by this and has to be guaranteed separately with energy procurement/-sales or supply infeed/-picks when exercising a transmission right. The Implicit Allocation process can stand alone without separating the capacity business from the electricity business. The capacity is utilised solely by organised market places (energy exchanges) for the purpose of coupling them (the so-called Market Coupling). An assignment of transmission rights to individual market parties is no longer necessary. Energy transfers are realised between the Central Counter Parties of the exchanges, in some cases with the aid of a so-called Shipping Agent. As part of the previous day energy auction (day-ahead), the allocations of capacity are done within the framework of Market Coupling. This refers to the determination of the market clearing results for all hours of the following day, meaning the 24-hourly market clearing prices and market clearing quantities in all coupled bidding zones, as well as their hourly current account balances to each other (import and export items) using one instance; all this while taking into account the available transmission capacities and with the aim of maximising the economic annuities (welfare) of the energy auction. The optimum exchange depends on the power bids in the participating electricity bidding zones as well as the available transmission capacity and leads (each hour) to either the full use of the transmission capacity or to complete price convergence of neighbouring bidding zones so that any additional exchanges would no longer be economically sensible. In the continuous implicit Intraday energy trade, the allocation of capacity is done by the next best bid pair (First-Come-First-Served). Optimisation is not possible in this case because of the continuous allocation. In coupled intraday markets, the order books show not only the bids from the local bidding zone, but also – depending on the available transmission capacity - bids from other bidding zones. When the bids match, a business deal is closed and the transmission capacity will be used via Central Counter Parties or Shipping Agents for its physical fulfilment. 1 NTC stands for Net Transfer Capacity; Flow-Based is based on a simplified grid model, taking into account load flow.